This is an 6″ to 24″, but usually 6″ to 12″ tall, usually erect, sometimes lying flat on the ground, bushy, perennial forb rising on a central, branching stem from a long, slender rhizome. The stems have two types of hairs. They are sparsely to moderately covered with short, loosely appressed or upward curving hairs. They are also sparsely to densely covered with long spreading hairs. The	leaves are alternate and on long leaf stalks. They are palmately divided into three leaflets. The leaflets are ⅜″ to ¾″ wide and inversely heart-shaped with the attachment at the narrow end. They are gray-green or green and usually hairless, but sometimes have a fringe of hairs along the margin. The margins are untoothed. 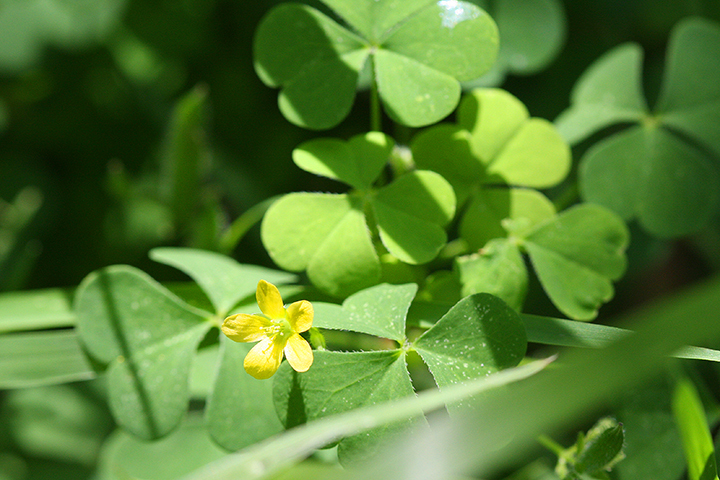 The leaflets open and spread outwards during the day. They fold closed along the midrib and droop downward at night. They also close under intense sunlight. They repel water, so that after a rain they look dry with water beads on the surface. The inflorescence is a branched cluster of 2 to 7 flowers usually held below the leaves. 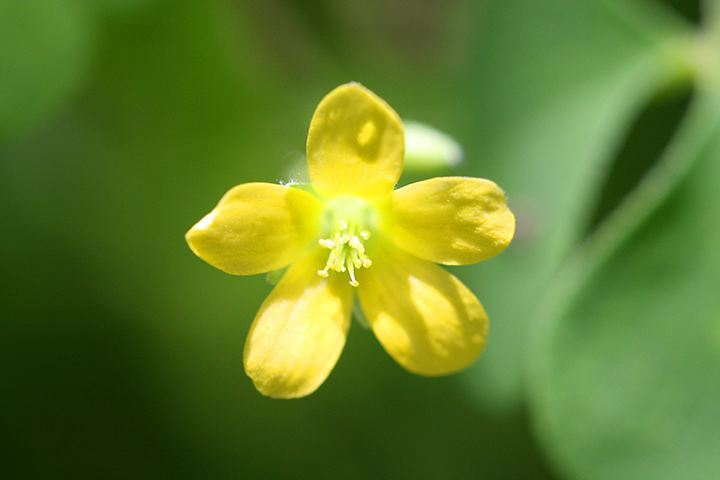 The central flower is flanked by two branches, each bearing 2 or more flowers. 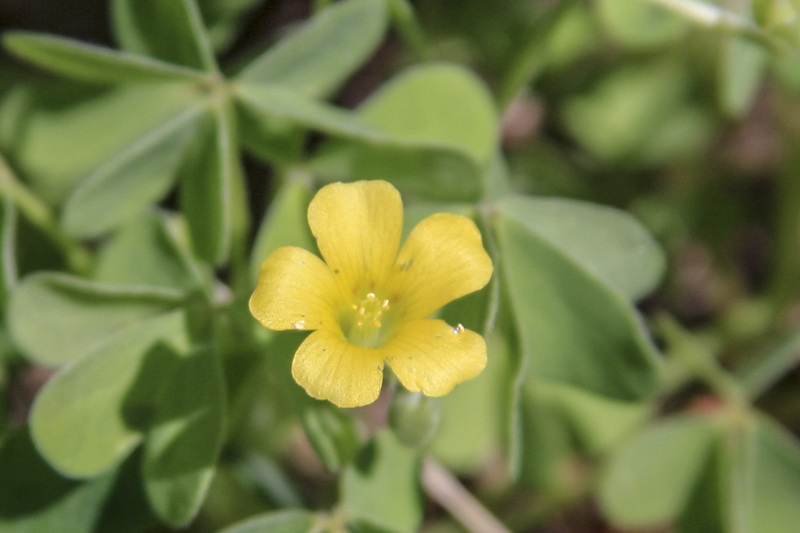 The flowers are about ½″ wide on long flower stalks that position them above the leaves. 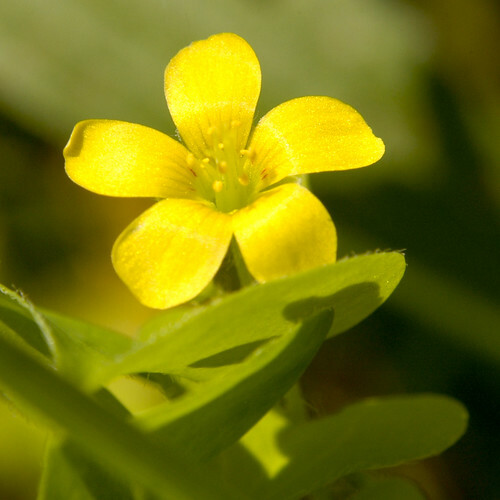 They have 5 petals and 5 much shorter sepals which are visible between the petals. Like the leaves, they close at night. The fruit is a ⅓″ to ½″ capsule held on an erect, unbent stalk. 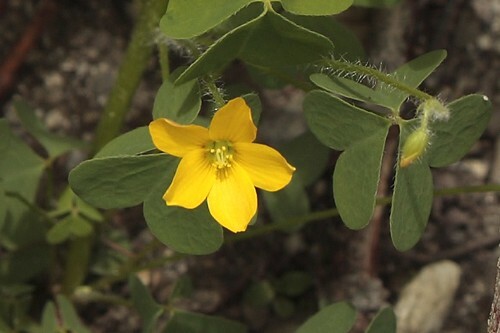 Southern yellow wood sorrel (Oxalis dillenii) does not grow from a rhizome. The stems have short, appressed or upward curving hairs but do not have long, spreading hairs. The inflorescence may be a single flower or an umbrella-like, unbranched flower cluster, with all flowers arising from the same point. The fruit is a ½″ to 1″ capsule held on an erect, unbent stalk. In Minnesota it is widespread but much less common. NOTE: The mnemonic of another plant (Stellaria media | Chickweed) in this course is based on the "4 essentials of survival ". The mnemonic of this plant is based on the "Rule of 3s". In any extreme situation you can't survive for more than 3 minutes without air, 3 hours without shelter, 3 days without water and 3 weeks without food. Now, assuming you're on land (looking at plants; not in a water survival situation), air in this mnemonic, will represent weather not oxygen. MNEMONIC EXPLAINED: You love, love, love (3 heart-shaped leaflets) this plant and it loves, loves, loves (3 heart-shaped leaflets) you. It first reminds you of the "Rule of 3s". It then provides those 4 things necessary for survival: perfect weather/air (yellow star-shaped flowers represent clear weather; sunny skies and starry nights; not a cloud in the sky), a tarp shelter (each leaflet represents a tarp and the fold down the middle [it folds at night; at bedtime] represents your ridge line tied between 2 trees), water (the erect seed pod capsules [they bend sharply upward on their stalks], on the plant, represent water bottles with pull spouts on top [a short point]. The bottles/seed pods are erect and have pull spouts so that all of the water won't spill out) and food (the entire plant [above ground] is edible). Oorspronkelijk uit Amerika afkomstig, nu overal ingeburgerd als onkruid op akkers en in tuinen, maar ook wel eens in het bos, zoals hier in Oranjewoud waar ik hem al jaren zie staan. 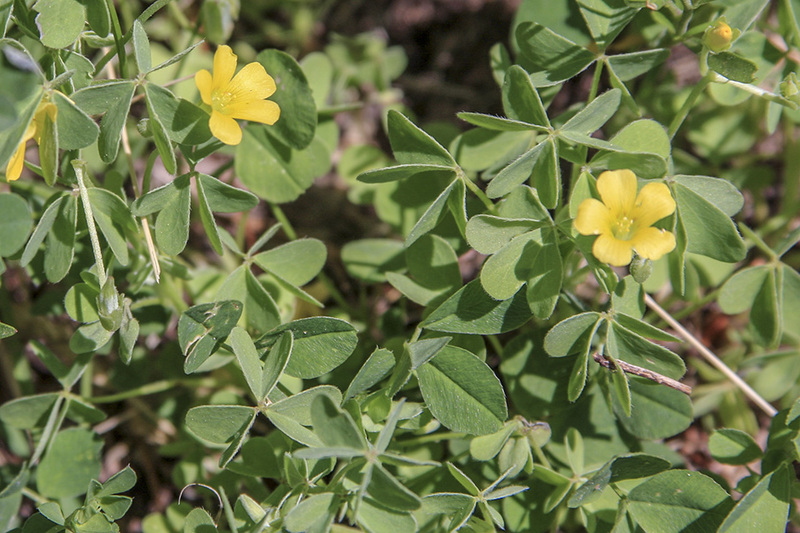 Yellow woodsorrel (oxalis stricta) seed pods that are mature will "fire" their seeds when touched. 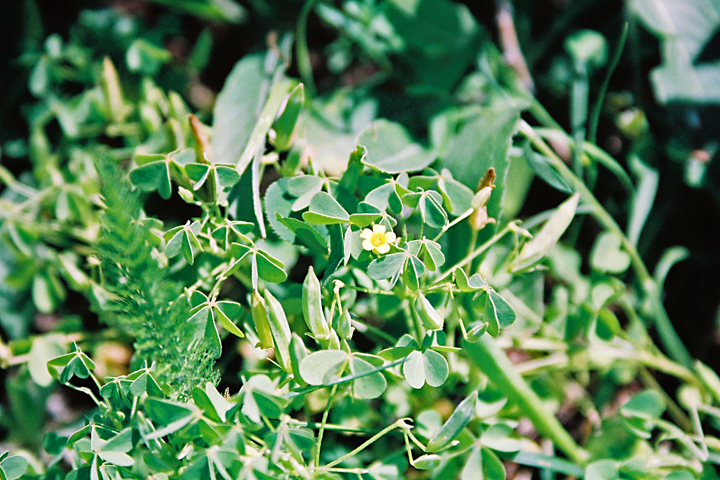 These weeds are effective at dispersing seeds up to 13 feet away. 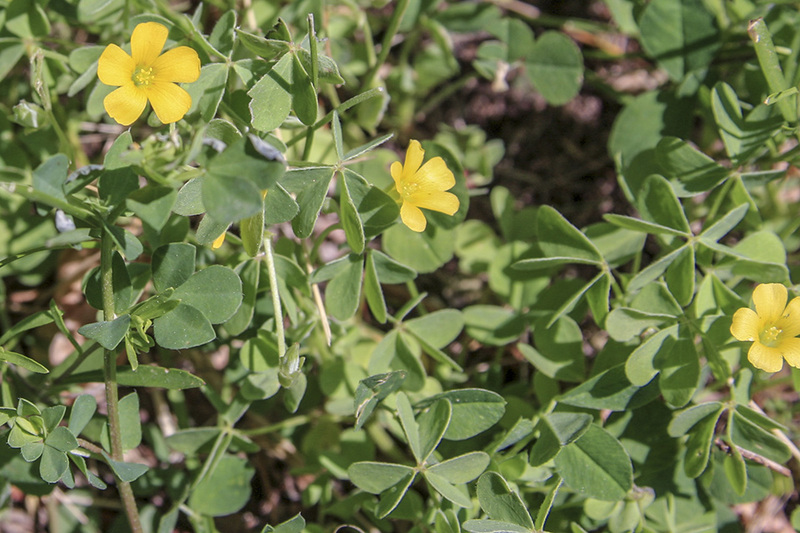 I recently identified my yellow woodsorrel and therefore discovered they they pop and scatter their seeds like members of the impatiens family of plants. I then decided that I must have a slow motion video of it happening. This plant is perfectly edible, but it does contain oxalic acid which can cause problems if consumed in large quantities. I use it as a trail nibble. It tastes real good and is tart like lemons. 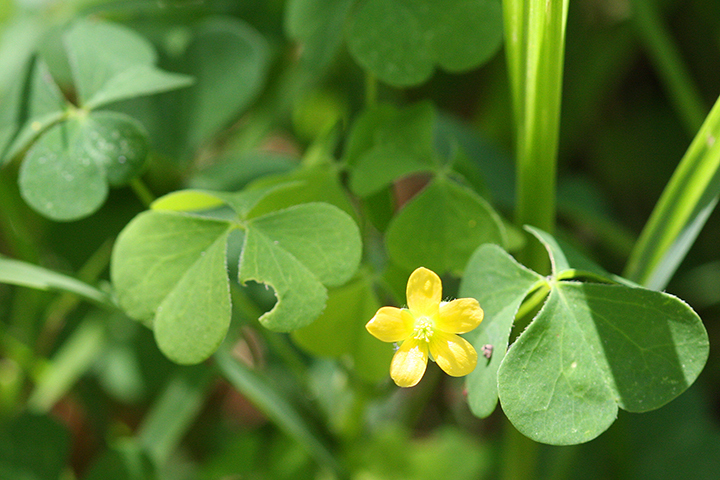 The tartness is a good sign that the plant may contain oxalic acid.